Unless otherwise noted, the following photographs (arranged geographically starting in Albany, NY) were taken by Fred B. Cupp at various times from the late 1950s onward. 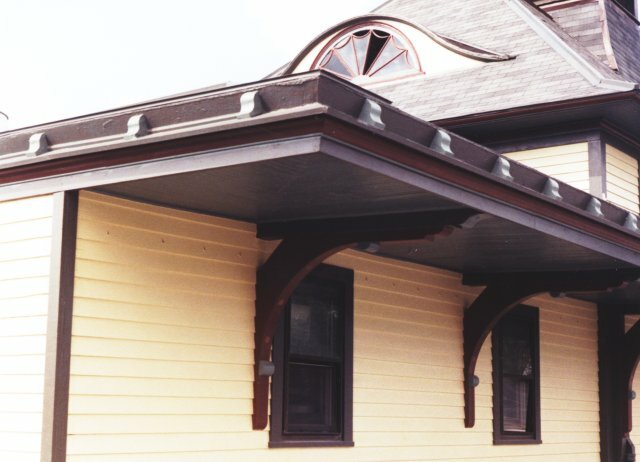 These photos are intended as reference material on the web for the use of modelers, and many images provide architectural details such as window details, color, or trim of the many and varied D&H stations. If you have similar photos, you may want to loan your photos to help build this collection. We are open to adding other categories, such as freight houses, telephone shanties, unusual track configurations, unusual railroad equipment, mile markers, and interesting lineside industries. If you have suggestions, feel free to let us know! If you have photos but cannot find a scanner, contact us and we will try to help out. Most of our members have interesting photos in our collections. Let's share them! Other New York station photographs can be found at Charles P. Woolever's Railroad Stations in NY State. The following links to locations and structures listed on this page are arranged in alphabetical order for ease of navigation. The Delaware & Hudson Railway erected and occupied this building as its headquarters in 1915. It is currently the home of the State University of New York's System Administration. This photo found by Jim Bachorz (photographer unknown). Judging from the clues in the background and the fact that the two big Dutch elm trees are gone from in front of the station, this photo was taken about 1950. Taken in mid-summer of 1998. The station is now being used as a local Senior Citizen's center and for local meetings. The Canadian Pacific Alco, an ore car, and the Mt. Moriah & Lake Champlain's homemade caboose are the start of a display/museum on the site. Mid-summer of 1998. Looking to the south, past the station. The machine by the track is a boring machine, driving a fiber optic cable underground, past the station. Also the backhoe at the right. Detail of the dormer windows in this model. Compare these with the dormers at the Cambridge station. The stations are similar in overall design, but very different in the details. 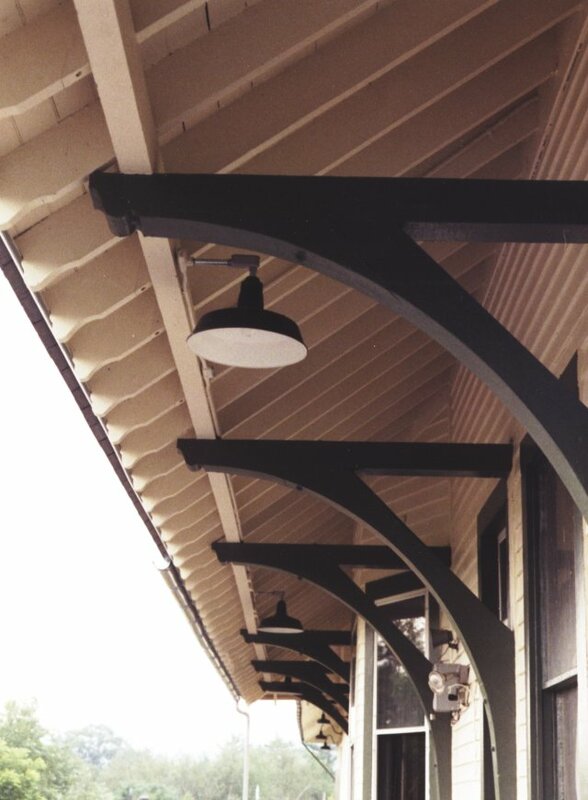 Roof details at the north end of the passenger shelter. A baggage wagon is parked in under. The indistinct blobs are large flower planters hanging from the roof. General view of the station. Detail of the roof overhang support braces. Station at Cobleskill, about 1970. While the station is decidedly run down, the tracks look well cared for and shiny. View is looking at the west (railroad south) end. Front center of the station. Of particular interest is the curved "eyebrow" attic windows. Unlike the Cambridge and Westport stations, there were no living quarters in the attic here. Looking toward the east (railroad north) end. The MoW trucks parked at this end (it was Sunday) suggest that the station was used to store supplies and provide an office for the maintainers. 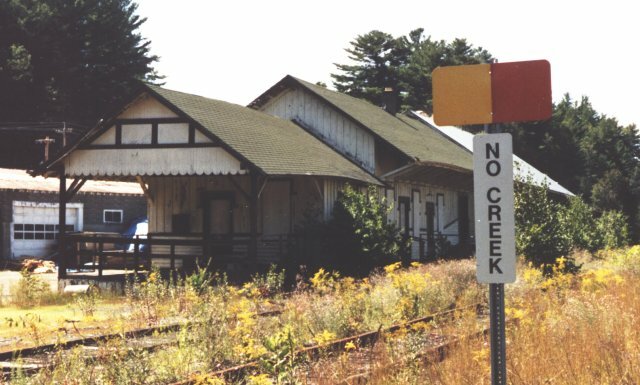 The track side of the west end of the station, summer of 1998. Notice the construction materials lying about. The station was being renovated for use as a restaurant in the freight house (west) end, and a bar in the waiting room (east) end. Center of the station, approximately at the same angle as the 1970 shot. The office area in the center of the building apparently is used for the manager's office and perhaps storage. The east end, shows the obvious location of the kitchen. Note the refrigeration units for meat coolers and the giveaway smoke exhaust blower over the grill. Flat on view of the east end. This gives a view of the many crazy roof angles and cupolas on the roof. Again, there is an "eyebrow" attic window on each end of the building. This is to show the unusual accent pieces along the roof edge. They are non-functional, only there for visual effect. Almost flat-on view of the street side showing the entrances. The main door has a beautiful oval etched glass design window, which is new from the restoration. The interior woodwork is original and is in excellent condition. Many layers of paint were removed in the restoration effort. Continuation toward the west end of the street side. The bar is in this end. Last shot of the west corner. 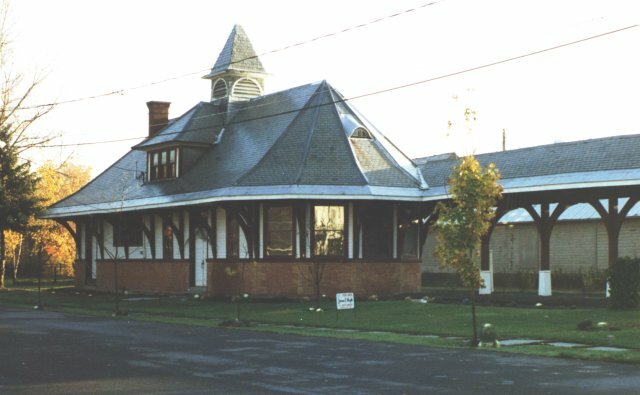 Altamont station as seen from the track side in 1996. Due to a gas station and dense growth along the track, a better angle was not possible. 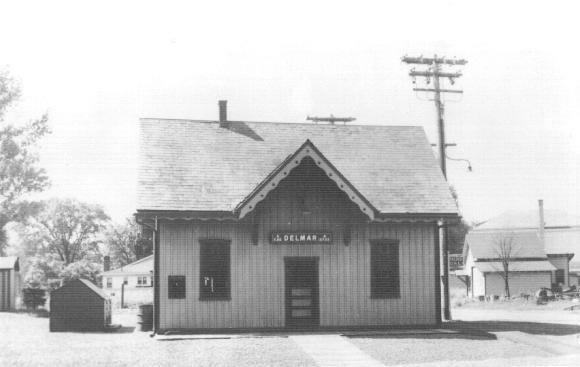 This station now serves as a dentist's office. Altamont from the parking lot (or street) side. 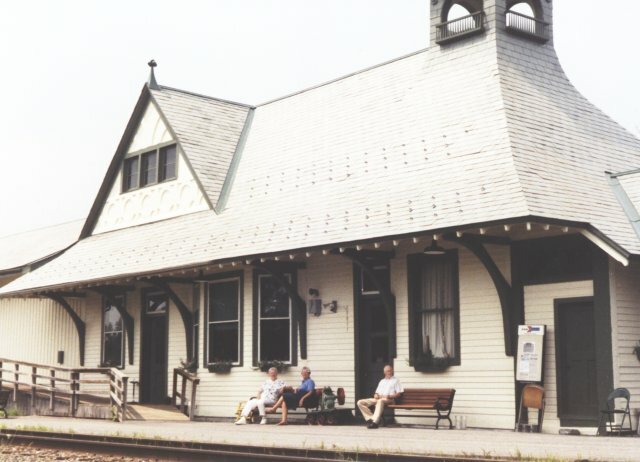 Although the Altamont and Cambridge stations are roughly the same size, Cambridge and Westport have living quarters (or at least a room) in the attic, while Altamont does not. The "eyebrow" windows are smaller than the ones on the Cobleskill depot. Altamont station on February 19, 2012. 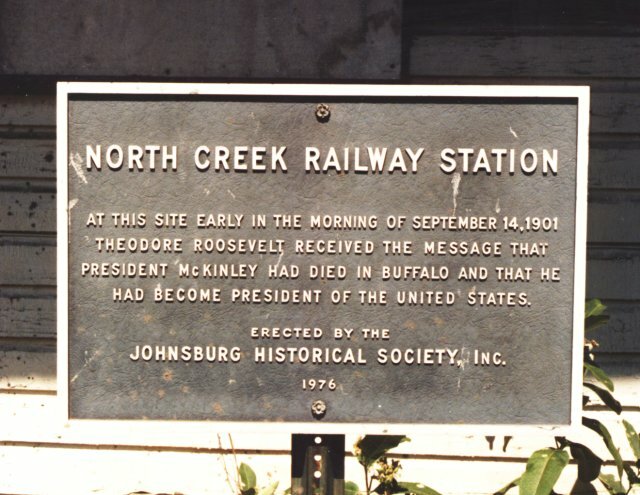 It was being renovated at the time, and they even added a new (replica) station sign. Photo by Rudy Garbely. Street side of the station. Photo by Rudy Garbely. Shot through the door on the street side of the station, looking at the bay window on the track side. Photo by Rudy Garbely. Sign on the street side. Photo by Rudy Garbely. Track side bay window with the replica station sign. Photo by Rudy Garbely. Track side of the station. Photo by Rudy Garbely. Restored platforms. Photo by Rudy Garbely. Cambridge station as seen from the track side, 1996. No fancy attic windows here. Plain ordinary double-hung sash. Cambridge station from the street side. The Cambridge Hotel, built in 1860, is right across the street. Platform shelter as seen from trackside, looking north, 1993. Note the tiny "Amshack" at the north end. Only the roof of the station can be seen over the jungle of weeds. Shelter roof over the walkway from the platform toward the station, showing construction details. Trackside view from north end of platform looking south. 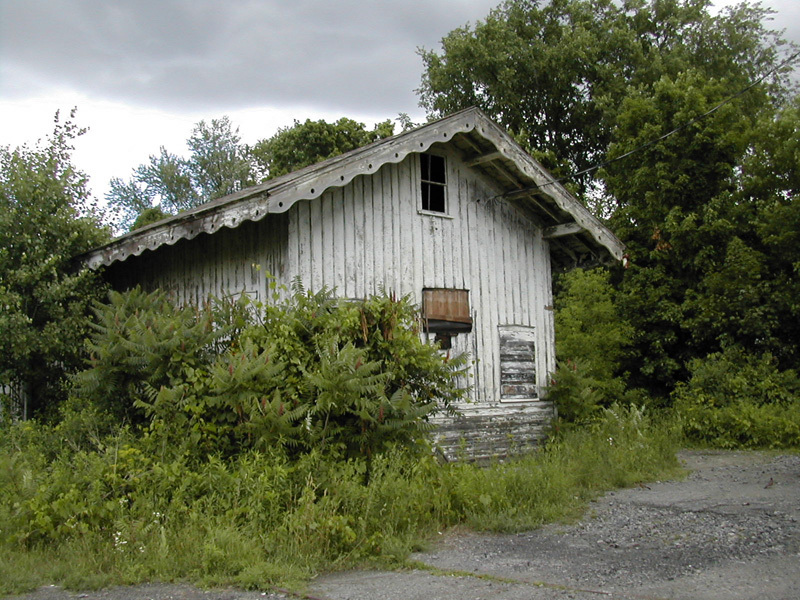 Plattsburgh depot looking north. Definitely showing the "French Provincial" influence in the design, as evidenced by the numerous corner towers and spiked tops on the tower roofs. Looking to the west, into the afternoon sun. This view looking southwest isn't much better, but it does show off the roof design. Windsor, NY is almost on the border with PA. Photos taken about 1969. This was on the line between Nineveh Junction and Starucca viaduct. Back side of the station. The station was in very poor shape in 2007 (Mary Sweeney photos). On July 19, 2007, the Friends of the Susquehanna River Rail-Trail announced that the Federal Transportation Enhancement Program awarded them a grant to finance the acquisition of the first leg of the trail. 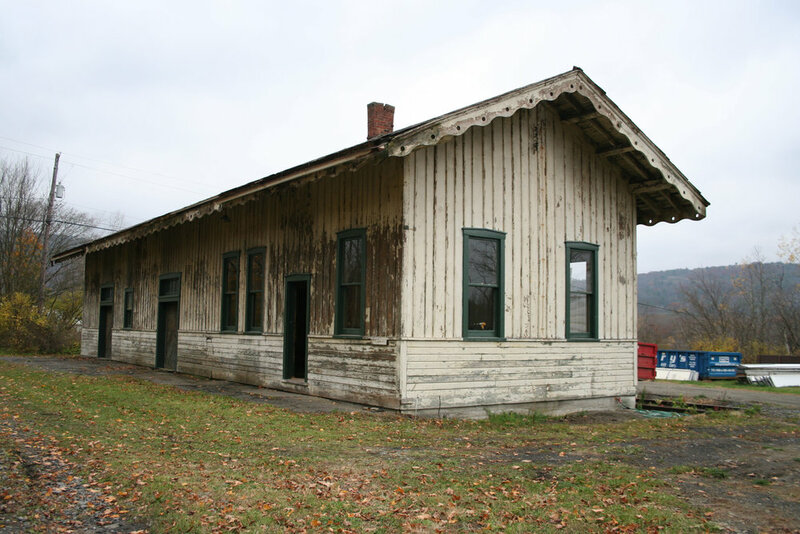 This purchase extended from the village of Windsor south to the Pennsylvania state line, and included the old Windsor Train Station, which the organization intended to preserve. 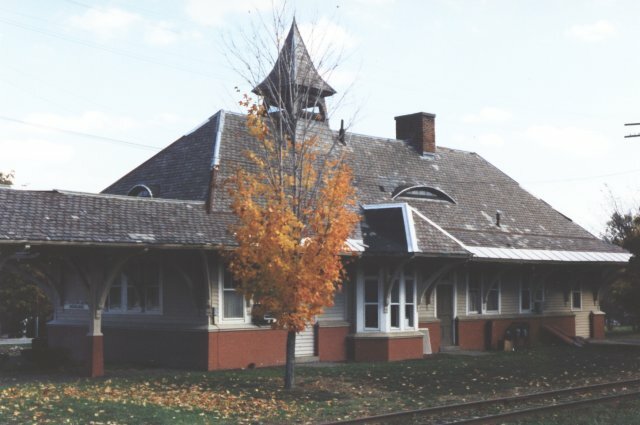 The station was submitted to the registry of historic places. In 2013, the station was purchased by the Village of Windsor. It is earmarked to be a local history museum known as the "Charles L English Windsor Museum.” The museum intent will be for both railroad memorabilia and local history displays. Much volunteer work was undertaken, building was secured (and dry), windows were restored, and new electric service was installed, as was interior wiring and plumbing. D&H GP38-2 #7303 passing by the station at Ft. Edward, NY. Photo by Ken Buckman of Broken Knuckle Video Productions. 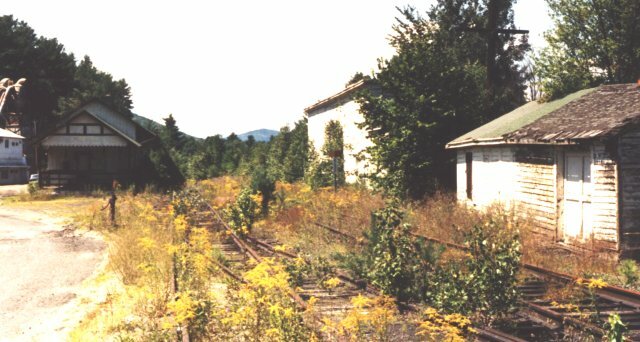 Fort Edward station in November of 1999. Photographed by Roger Smith while on vacation in Poultney, VT in August of 2007. Station and freight house look well-preserved. 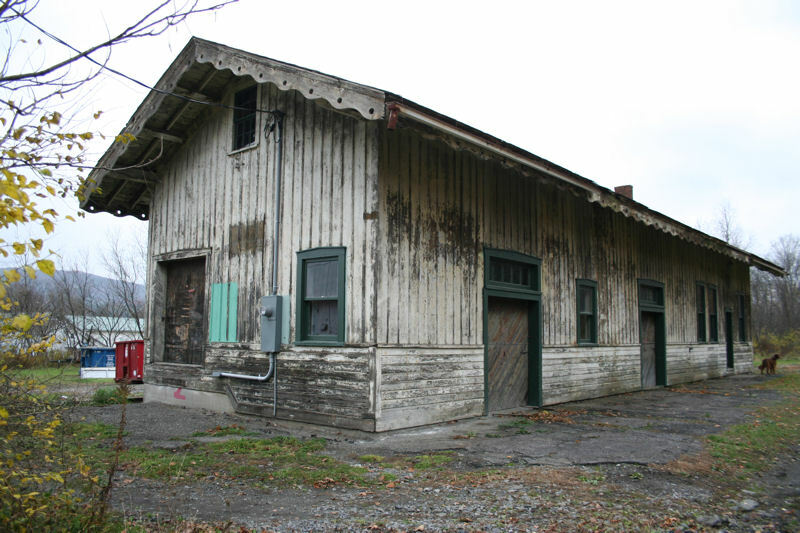 Photos of the Scranton freight house by Michael G. Rushton.